Proudly representing Olympus systems to our health education market niche since 1995. From our first microscope workshop in Phoenix Arizona in March of 1995 through current all-encompassing classes at our Biotorium Health Learning Lab in Chicago, we have been leading the charge for health care practitioners who want to engage their client base in new ways. 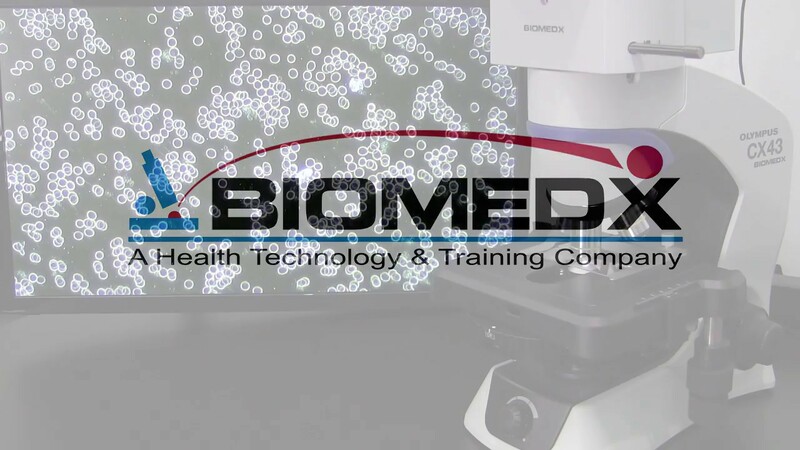 With Biomedx HD video microscopy, your clients can be taken on a fantastic voyage through their "life in the blood." This provides them an unprecedented education on what makes their health tick, while at the same time giving them a driving motivation to act on healthy protocols. In 1999 we developed one of the most highly regarded state of the art multi-platform microscopes for the alternative and complimentary health field doing live blood work. We kept up that level of excellence over the ensuing years with version updates. Today we have a new system for another generation. For busy practitioners it is smooth, very fast to operate, and provides incredible micro imaging. For docs and staff alike, it is almost impossible to screw things up. (And with over 20 years of providing tech support to practitioners and staff we know all the ways that can happen.) With our next gen model and its engineered integrations, it all makes for a trouble-free and consistently accurate microscope experience. The Biomedx enhanced and configured Olympus multi-platform microscope for the next generation of the Wellness Revolution. Take your health practice endeavors in clinic microscopy to the moon (and the bank) with a Biomedx configured Olympus microscope system. With over two decades of implementing the best live blood / live cell qualitative auditing systems providing big screen, HD, and superior imaging capabilities, we know exactly what works and works best for practitioners; from the health coach through to the functional, biological, alternative and complimentary medical doc. The slides here will be a brief intro to your system, below we'll expand on the specs, the imaging, and point specific configurations for your practice. The color temperature of the system's LED illumination produces daylight conditions, so specimens can be viewed with their natural colors. The color temperature is consistent at any brightness, so users don’t have to spend time making adjustments when changing brightness levels. The LEDs have a long 60,000-hour lifetime built into the design, helping reduce cost, and the brightness level remains stable throughout the LED’s life. The low-positioned focusing knobs enables users to make observations while keeping their hands and forearms rested on the desk, helping provide comfort. The focusing stopper prevents a specimen from accidentally hitting an objective when working under a high magnification. A multi-mode universal condenser provides you with brightfield, darkfield, phase contrast and 3D view with a simple rotation of the turret. It is factory set and calibrated at a fixed position so finicky technical condenser adjustments on the x-y-z axis are a thing of the past. By locking the aperture diaphragm, a favorite optimally chosen position will stay in place even if accidentally touched while changing slides or turret modes. In combination with the five-position revolving nosepiece, multiple applications can be covered using this single microscope frame. A selection of objectives key to your work are tyically incorporated in Biomedx configurations. For example, a 2X objective for wide area observation is best for dry blood oxidative stress screening. A 20x phase contrast objective is ideal for scanning for spirochetes in gingival samples, scanning urine, and it also gives a great wide field view in darkfield for live white blood cell scans. A 40x phase objective is an every day (non-oil) working optic for live blood / live cell viewing in all condenser modes; high contrast brightfield, darkfield, phase contrast and 3D. Olympus phase contrast is the best in the business and is so good, when coupled with our imaging systems there is no need to ever have to use messy oil to get stellar imaging to give you the information you need day to day. You can flip on the fly between phase contrast and darkfield without the hassle of oiling objectives or condensers. But if you want to move to oil you can with the appropriate objectives. This microscope has achieved a new technological advancement with “Koehler illumination (fixed field diaphragm)”, so users don’t ever need to adjust the condenser to achieve effective Koehler illumination. This technology specifically prevents incorrect operation from unintended user error and as a result, it always offers the best imaging visibility. In addition, a full range of objective magnifications from 2X to 100X is available to use with the condenser equipped as standard. And Excellent For BIG Screen Presentations. For our select health care market we tested numerous camera chip sets, formats, interfaces and operability factors to get it right. For clinic presentation modes, we found straight USB only cameras didn’t cut it. Being limited to video image viewing through a computer interface had many inherent problems. However, HDMI output through a standard HDTV – with the right camera chipset – makes for a beautiful experience. For those that want to manipulate images on a computer via software, this camera can be completely software driven with an optional WIFI connection (software and WIFI connector included with all systems). The camera however can do it all on-board as needed. A wired mouse connects directly to the camera so no computer hookup is even necessary if you’d rather not move to that level of complication. You can capture images and video directly to the removable memory card in the camera, zoom in and out of your image, even manipulate your auto or manual control settings to adjust your video imaging on the fly. One thing we discovered in testing numerous cameras for our systems is that camera specifications do not tell the whole story. We’ve seen great specs that we thought would be stellar performers, but when all hooked up they did not have the live cell imaging we demanded and many failed at providing good darkfield light sensitivity. Far more important than a raw megapixel count is pixel physical size and the relationship of pixel quantity to standard HDTV dimensions for the best on-screen view which is what we want. Many cameras might look the same on the outside, but the tech inside can be a different story. Our cameras incorporate ultra high performance Sony sensor technology for video microscopy with super-size pixels for huge dark signal sensitivity. On our scopes with these cameras you get good live blood darkfield using only the multi-mode turret condenser – even without having to use oil. And that is awesome when things get busy or you have staff doing the work – it means no oily mess or continual cleanup. This is a bare bone system which has the two minimum required objectives (4x & 40x) to do dry layer and live blood work in video only mode. The eyepiece oculars and view head have been removed. It gets you into the finest scope available for this work at the lowest cost right now. As your budget allows you can add components to get the rest of it moving into the “everything you need” most popular system. This is a basic system which has the wider field 2x objective for dry layer work and the 40x objective for live cell. It has the core components of our most popular system (heads, oculars, etc.) but is missing the 4x, 10x, and 20x objectives so you’d be missing some of the scanning flexibility of our most popular system, but it gets you into a solid performer now which you can upgrade later. Everything you need. 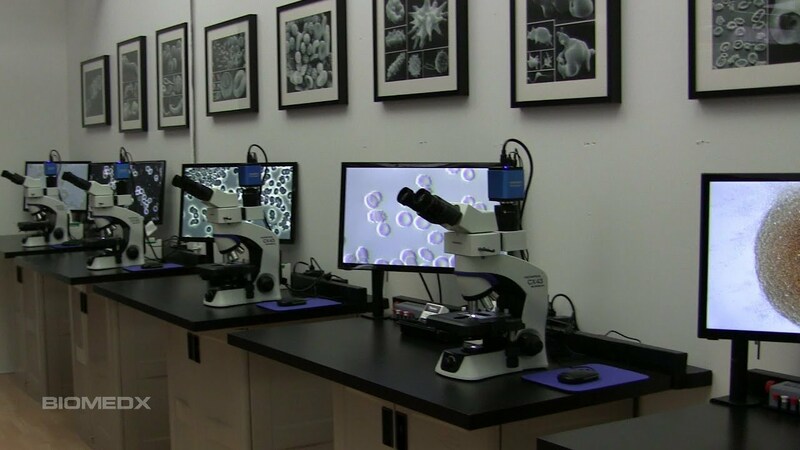 This is our core educational health coach through alternative and complimentary medical doc microscope system that does it all in an easy and most efficient manner. 2x, 4x, 10x, 20 & 40x phase objectives – all non-oil – gets you cleanly up and going with the best available technology. Dry layer, live cell, gingival, urine scanning, soil and water review, product checks, sperm motility, white blood cell counting and more. It’s an overall biological viewing and educational workhorse that has the capability of serving you for decades. This system takes out the 4x objective and plugs in a 100x oil phase objective for increased resolution and magnification for the times you might want that. It likely won’t be the day to day optic for most clinics, but when you want that close up detail view of an organism, or are having big screen live blood wine and cheese parties, this system will give you imaging with all the Olympus oil optic phase contrast brilliance. We take the 100x oil system and replace the 10x optic with a 50x oil iris objective to provide a higher level of darkfield intensity and refinement. This is done for those individuals that have been trained in mostly darkfield mode for live blood imaging and want a slight edge for darkfield by using an oil optic. Here we take the Darkfield Edge system and remove the 100x oil phase objective and replace it with a 100x oil iris darkfield objective. This is specifically for those individuals that have been trained in mostly darkfield mode for live blood imaging and want to preferentially use that mode with oil optics. For the biologically tuned-in dentist. Show clients exactly what is hiding under their gumline. The microscope is a sure fire way to know if spirochetes, long rods, clock form bacteria, amoebas or more are lurking and posing possible health issues. A bumped up video mag system with 20x scanning and 40x detail phase objectives for beautiful spirochete imaging. Things nano are the rage, liposomal nutrition is just one example. But how small is your target particle? Is everything going into solution in your sample? You can continually pay a lab to know, or get this system for your operation and do it whenever needed. Get an idea on size down to about 50-100nm. It’s not electron microscopy resolution, but it’s not $50k either. It’s an enhanced video mag system with 40x dry and 100x oil optics, calibration slide, video sizing and drawing software. Plug into a big screen and see the big picture on your product. A Quick Setup Guide showing you how to put it all together along with the Olympus microscope manual itself. This is the perfect system for the health care facility engaged in education and helping people understand the deeper details of their health. 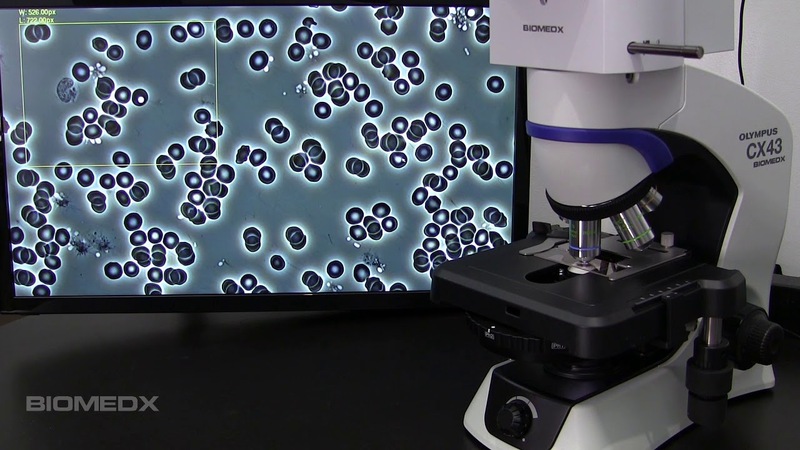 In the "live blood analysis" health market niche, it was often said that you need to have a "darkfield" microscope in order to see what you want in blood. Well, that is very old information based on literature written prior to the invention of phase contrast microscopy by Frits Zernicke. Phase contrast provides shading and morphological discernment for many blood elements that is simply unattainable in darkfield mode, although darkfield does have its place and is used where appropriate. But it is not the "mode" for live blood analysis that some might have you believe. Today some teachers that sell microscopes in their programs still put out the old information about requiring darkfield along with oil as well. Often this position is held because the microscopes they have just don't do phase contrast very well and they have to use oil with their systems to get the performance they want. With the systems here that's just not the case. You get total performace excellence all around for your live blood journeys with your clients. One reality we have had to deal with is factories in China flooding the market with microscopes of every conceivable brand name. Some are a lot less money promising to do “darkfield” or live blood analysis – but not too well – and some even cost a lot more. Some sellers say their microscopes are from Japan, but dig deeper and it’s likely they got there by way of China. Not that that is bad, but all manufacturers are not the same. Certain imaging like phase contrast is done poorly by so many – from China and elsewhere – but it is a mode that requires perfection, and Olympus provides that. >There is also just a certain “feel” to operating some of these off and other brand microscopes that simply put, is kind of clunky. By comparison, Olympus operates smooth as silk. We service a professional health care market and put our name behind this as well. We don’t just sell microscopes, we also support the health care practitioner and others doing this work. Our perspective is that if you are a pro, you should want the best microscope at the best price without compromise and where the best imaging and quality is concerned, you can’t beat Olympus and the Biomedx configuration and video setup for these systems. If best is what you want with a company that has served this market for over two decades and offers concurrent support as well as dynamic training should you want it, well you’ve found us. Can these systems be leased? Yes. We have a great lease company in Wisconsin that can do this and some in Canada. If you have an existing lease company we can work with them. Outside of the North American market we do not have lease resources. Note that a lease company typically wants to see a track record of being in business at least 2 years with a good credit history. Getting a lease on a new business or start up is difficult. If you are in the difficult category and still want to make timed payments, we do take credit cards and there are a few credit card companies out there that extend zero percent financing for the first 6 to 12 months on a new card. You can do a search for one of those companies if that situation fits. Can the systems be upgraded? Yes, always. If you purchased any system and decided you wanted to add another objective for example, you can do that at any time. Systems are totally flexible in that way. Can the multi-mode turret condenser be removed? No, the multi-mode universal condenser on the Olympus CX43 is factory set in place and cannot be removed. On the plus side, this makes any technical screw ups that might happen with adjustment and calibration of the condenser almost non-existent. Can I use a dedicated oil darkfield condenser? No. As per the last question the multi-mode turret condenser is fixed to the frame and no other condenser can be used. The only darkfield condenser we imagine you might want would be a dedicated oil cardioid darkfield condenser. These are the best for pure darkfield applications and we used these sometimes in our older system for individuals that wanted it, but those weren’t many. The references in some writings that certain blood forms can best be seen or only appear in darkfield were written before the invention of phase contrast. Phase contrast changed the game yet today some still adhere to those old references. Part of this is because there are a lot of poor phase contrast objectives in the marketplace with poor imaging. If that is all one has available, then using an oil cardioid darkfield condenser with a LOT of light to push through it would likely be much better. That said, Olympus makes incredible phase contrast objectives. With image rendition to an HD monitor and having a full range of shading capability form white to black and everything in-between, live blood imaging and more is simply stellar with phase contrast. For many with this new technology, darkfield has become passe. However with a multi-mode condenser and our darkfield enhancer on the CX43, you can have both, super phase contrast and pretty decent darkfield as well. This might be for times you’ll flip to it to check out nuclei in white blood cells or for white cell counting, or for additional differentiation of those or other forms as you might desire. What type of display monitor should I use? For a primary display that is economical and looks great, consider a standard flat panel HDTV with 23″ being the smallest. (You can also travel with these pretty easily if you are a roving microscopist.) We have a few 23″ models made by Vizio on desktop arm mounts in our workshop space on the microscope benches and they look great. With an HDTV the image can also be optimally tweaked from the TV menu while straight computer monitors don’t always offer the same level of image adjustment as a TV does. 28″ can also work very well with a desktop arm mount while also providing a larger image for a bit more impression. Our cameras put out a 1920×1080 size image and that is what you will find in smaller monitors. These are also known as 1080P. Smaller monitors could also be 720P but you will want one that does 1080P not the 720. If you’re going for very impressive presentations, consider a 40-50″ or so wall mount TV. The larger HDTVs today are all moving to 4K today which is double 1920×1080. Ideally a 4K camera would be desired for this but currently we have yet to test one that was satisfactory for our purpose. As we mentioned elsewhere on this webpage, specs are not everything and a lot goes into getting the right image we need and want to see out of a camera. That said, the 4K TVs today do a decent job of upscaling standard HDTV to their 4k mode. So you could get a 4K now and when a suitable camera is available you could update your system at that time if desired. However the image as it is now is outstanding and you may not feel the need to be upgrading anything for a long time. Standard big screen HDTVs are getting really inexpensive so cost-wise they are a great deal and the basic 1080P display exactly matches the camera and the imaging is the best when you have camera and monitor matched. Either way, having HDTV as a main display (as opposed to a computer monitor) for your system is the way to go for most. Our cameras also output WIFI if desired for a secondary display to see the image on a laptop or tablet using the included imaging software. If you are traveling with your scope to do a distance presentation away from the main office, you could use a laptop monitor as your main screen in a pinch, but it is not the best as there is a slight WIFI lag in passing the real time image from the scope to the camera. But as we previously noted, a 23″ HDTV for example is very light and travels very easy as well while also providing a superb image. Yes absolutely, this is new equipment. The warranty is in the tab section below. And here is something to know: In two decades of selling Olympus microscopes, we’ve never had a single warranty issue arise, ever. Olympus microscopes are engineered and built very well. The only repair issues that seem to arise are typically travel related – TSA, baggage handlers, etc, – or something like a client smashing a cable when closing their suitcase. With this system you can rest assured that if you keep it clean and put a dust cover on it before bed, you will have a solid microscope and component group that will work for you every day like the first for a very long time. light path eyepiece/camera is 100-20/80 via prism slider. 8th non-indent position is a DF offset providing a 3D view. Observing Methods: Brightfield, simple polarization, phase contrast, darkfield, 3D. *These are the 5 objectives included in our most popular system. B) one (1) year for electrical, or wear-related components. Olympus microscopes through Olympus America, Inc, of which Biomedx is an OEM/VAR (Original Equipment Manufacturer/Value Added Reseller), applies similar terms, and those terms are covered in greater detail in the document linked below. For purposes of service for any defective item, Biomedx should be the customers first point of contact for the problem. If any Product proves to be defective within the relevant warranty periods, the customer must return the defective Product to Biomedx with; 1) invoice showing date and place of purchase, 2) a detailed description of the problem. Customers may be entitled to a service loaner if their Product is sent back for repair and the Product is under warranty. Biomedx can provide service loaners based on availability of product at its sole discretion at the time of repair, but service loaners are not guaranteed to be “right now” or always available. Biomedx (or Olympus under its own terms where applicable), at its sole discretion, will repair, replace, or adjust the defective Product, provided that an investigation and factory inspection disclose that 1) such defect developed under normal and proper use and 2) the Product is covered under this limited warranty. Repair, replacement, or adjustment of defective Products shall be Biomedx sole obligation and the customer’s sole remedy hereunder. The customer is liable and shall pay for shipment of the products to Biomedx. Biomedx shall not be obligated to perform preventive maintenance, installation, de-installation, relocation, or maintenance. Biomedx reserves the right to 1) use reconditioned, refurbished, and/or serviceable used parts (that meet Biomedx quality assurance standards) for repairs and 2) make an internal or external design and/or feature changes on or to its own Products without any liability to incorporate such changes on or to the Products. defects or damage to the Products resulting from wear, tear, misuse, negligence, sand, liquids, impact, cold, heat, light, humidity, fungus, other life form infestation, improper storage, non-performance of scheduled operator and maintenance items, or use of non-Biomedx brand accessories where required, consumables, or supplies; software programs; supplies and consumables. Except for the limited warranty set forth above and for that which applies under terms of the direct Olympus warranty, Biomedx makes no and disclaims all other representations and warranties, whether express or implied, concerning the Products including but not limited to any implied warranties of merchantability or fitness for a particular purpose, or concerning any patents or technology used or included therein. If any implied warranties apply as a matter of law, they are limited in duration to the length of this limited warranty. All guarantees, warranties, conditions, and representations whatsoever, either express or implied, whether arising under any statute, law, commercial usage or otherwise, are hereby expressly excluded. The customer acknowledges and agrees that Biomedx shall not be responsible for any damages that the customer may incur from delayed shipment, Product failure, Product design, selection, or production or from any other cause, whether liability is asserted in contract, tort, (including negligence and strict product liability) or otherwise. In no event shall Biomedx be liable for any indirect, incidental, consequential, or special damages of any kind (including without limitation loss of profits or loss of use), whether or not Biomedx shall be or should be aware of the possibility of such potential loss or damage. Representations and warranties made by any person, including but not limited to dealers and representatives of Biomedx, which are inconsistent or in conflict with the terms of this limited warranty, shall not be binding upon Biomedx unless reduced to writing and approved by an expressly authorized manager of Biomedx. This limited warranty is the complete and exclusive statement of warranty which Biomedx agrees to provide with respect to the products and it shall supersede all prior and contemporaneous oral or written agreements, understandings, proposals, and communications pertaining to the subject matter hereof. Ready to Buy Your New Microscope? that will put it all together for you.